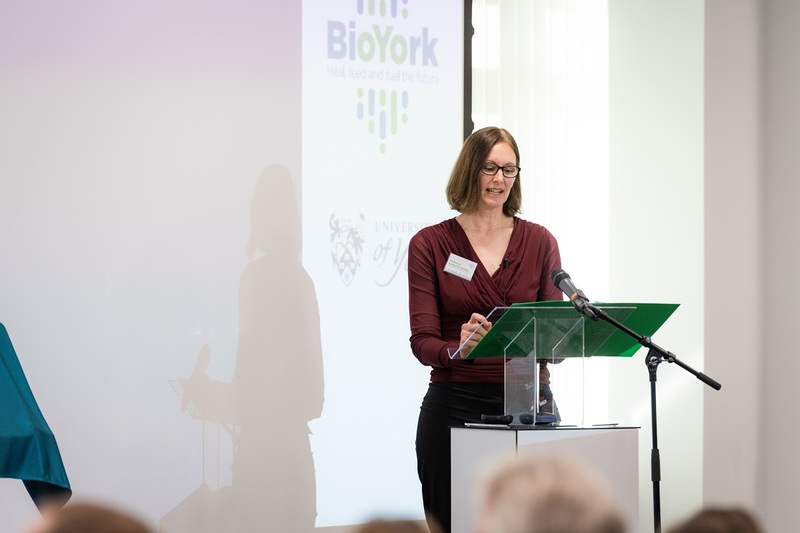 The Princess Royal was given an insight into the importance of sustainable food chains as N8 AgriFood’s Academic Director Katherine Denby spoke at the launch of BioYork. Princess Anne was guest of honour at the official launch of the new bioeconomy initiative from the University of York. BioYork has been established as a focus for bioeconomy activity in the North of England as part of an interdisciplinary approach to research into health, food and bio-based fuel and chemicals. 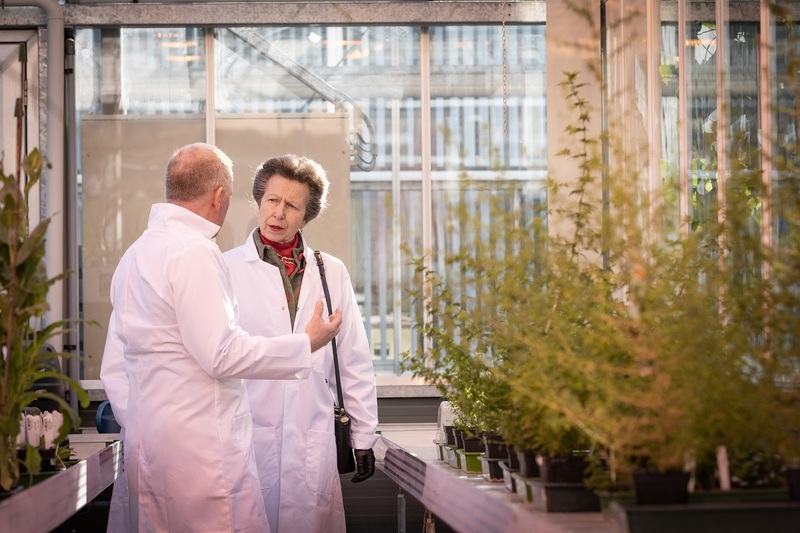 During her visit The Princess Royal met senior University staff behind the initiative and toured the University’s research facilities, including the glasshouses. Professor Katherine Denby, pictured below who is the Academic Director for N8 AgriFood, and is based at the University of York, gave a presentation during the launch. She said: “The Feed theme of BioYork harnesses expertise in crop and soil science with innovative businesses in the bioeconomy to tackle the challenge of how to sustainably feed our growing population. “The challenge for industry is to develop and implement new agri-food systems that prevent soil degradation, increase soil carbon and maintain healthy soils; and to develop new technological solutions to enhance crop growth whilst minimising the environmental footprint. “Industry needs to tackle the challenges that arise from climate change – and develop new resilient varieties of crops more quickly, and biological solutions to reduce crop waste that do not rely totally on chemical control. “The challenge for the food industry is in enhancing the nutritional quality of crops and maintaining that nutritional quality throughout the supply chain, through to processing to the consumer. “BioYork is working with industry to deliver commercial solutions to these challenges – exploiting our scientific knowledge, expertise and facilities and connecting companies with the newest ideas and techniques. “We have used comparative genomics, transcriptomics and data modelling to tackle barriers to crop improvement. 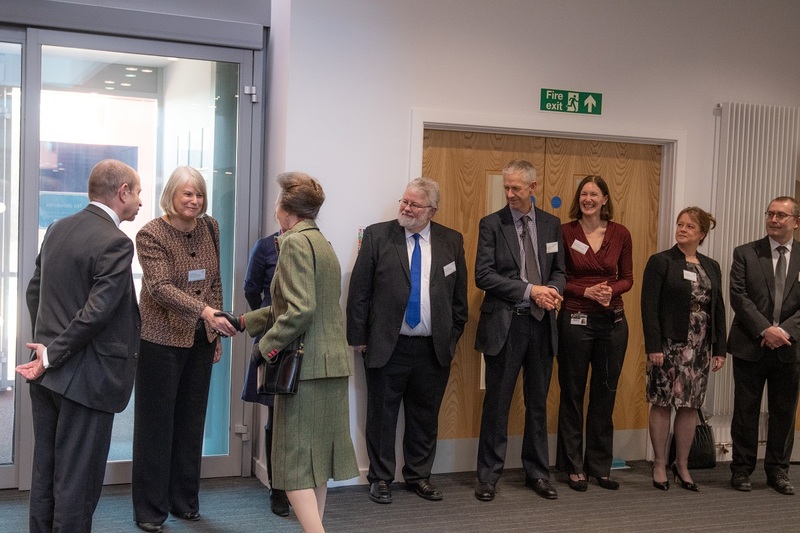 The launch event also heard from N8 AgriFood’s Principal Investigator Professor Debbie Smith, pictured left greeting the Princess Royal, who gave the formal introduction to the launch. There are more than 16,000 bioeconomy related companies in the North of England, with a total annual turnover of over £91 billion, employing around 415,000 people. The bioeconomy is estimated to be worth £220 billion in the UK alone, and the Government’s Industrial Strategy is setting ambitious targets to double its size by 2030.